Guess What’s Coming Up The Road? The U.S. Environmental Protection Agency (EPA) announced that Lehigh Cement Co. and Argos USA have settled alleged Clean Air Act violations at a portland cement manufacturing facility in Martinsburg, W.Va. The International Cement Seminar Returns! Camfil APC rolled out Gold Cone X-Flo (GCX) Filter Cartridge for high-efficiency industrial dust collection. Building on the proven performance of HemiPleat Gold Cone technology, GCX filters stay cleaner and last longer than conventional pleated filters, noted the manufacturer. Camfil Air Pollution Control (APC) parent company Camfil (Stockholm, Sweden) appointed Magnus Yngen to the position of president and CEO. He succeeds Alan O'Connell, who held the post for the past 12 years and was instrumental in taking Camfil to its current position as a leader in the air filtration industry. Yngen has been a member of the Camfil board for the last year and brings to his new position a solid international business background from several industries. Prior to joining Camfil, he worked for the Electrolux Group, with management responsibility for its European operations, and was later appointed CEO of the Husqvarna Group. The Camfil APC operation specializes in industrial dust collection. 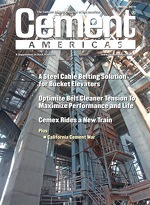 The U.S. has traditionally been Camfil’s primary market for dust collection equipment; but through a planned expansion program, its popular Farr Gold Series product line is being rolled out globally and is now marketed in Europe, Latin America, Australia and Asia under the direction of Camfil APC President Lee Morgan, who reports to Magnus Yngen.